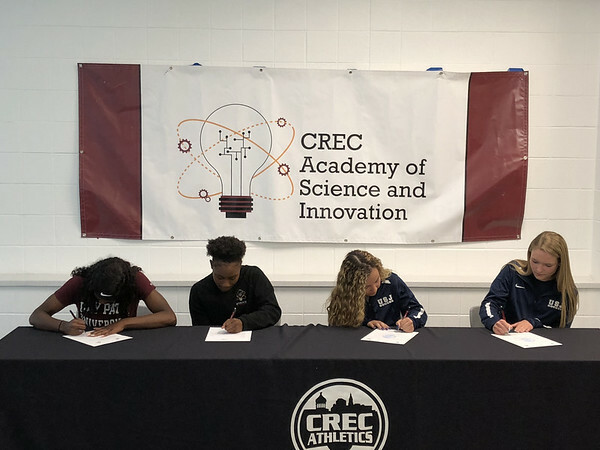 NEW BRITAIN - Innovation’s Aryanna Townsend, Kelsey Walicki, Victoria Piechota and Chriseny Perryman were part of school history Tuesday afternoon. The four athletes announced their decisions to continue their athletic careers at the collegiate level. They were part of the first signing day ever hosted at the school, four years after Innovation started its varsity athletic programs. Piechota, Walicki and Townsend will all be playing soccer in college. Townsend will be attending Bay Path University and also participating in track. She’s a three-time CRAL All-Conference selection in soccer on defense and was named to the All-State team this past season. Townsend also became the first soccer player to play in the Senior All-Star game. At college, she will look to follow the path of her mother Nadeen by entering the program for physician’s assistants. Her mother is a respiratory therapist, and growing up Aryanna was inspired to do something similar. It was a bittersweet day, as Townsend will be leaving the school that has brought much joy to her over the years. Piechota and Walicki will be continuing their soccer careers together at the University of Saint Joseph in West Hartford. The combo will look to bring the success they’ve had at Innovation to the Saint Joseph program. After six wins in the first year Innovation had a varsity program, Piechota and Walicki had a major part in building the team into a Class S power. Over the past three seasons Innovation combined for a 36-8-4 record and made the state tournament in all four years. Walicki was a four-time all-conference selection at left midfield and a two-year captain. She holds the record for most assists in a career with 30 and shares the record of most goals with Piechota with 58. At Saint Joseph, Walicki will be studying nursing. Piechota was a four-time all-conference selection at forward and also was a two-year captain. She was the first athlete to be named to the All-State team in any sport at Innovation, one of her most fond memories. Piechota owns the Innovation record for most goals scored in a single season with 21. In the classroom Piechota is equally impressive, as she is the Class of 2018 salutatorian and will be studying pharmacy with a concentration in biochemistry at Saint Joseph. Perryman will be attending American International College in Springfield, Mass. She was a four-year varsity track member and all-conference member. She’s part of the team that holds the school record in the 4x100. For Perryman, just being able to attend college is extra special. Perryman will be studying exercise science in college and hopes to become a physical therapist or physical education teacher. Posted in New Britain Herald, Innovation on Tuesday, 5 June 2018 19:44. Updated: Tuesday, 5 June 2018 21:10.